Q From Dallman Ross in Germany: Are compleat and complete really two separate words, as the American Heritage Dictionary seems to say? Or is the former merely an alternate spelling of one meaning of the latter? While compleat is said to mean ‘quintessential’, one meaning of complete is closely related as ‘skilled; accomplished’. A In Britain, compleat is archaic, used in writing only as a bit of whimsy, and at that rather rarely. It is more common in North America, though often equally whimsical; a quick search of the Web turned up more than 40,000 instances, of which all those I sampled were from the USA. The Oxford English Dictionary says that compleat is just an archaic spelling of complete. It died out around the end of the eighteenth century. One of its last appearances was a reference to George III in the US Declaration of Independence: “He is at this time transporting large armies of foreign mercenaries to compleat the works of death, desolation and tyranny”. The OED also says that one sense of the word (in either spelling) is the one you quoted — referring to a person who is accomplished, “especially in reference to a particular art or pursuit”. This sense died out in Britain in the early nineteenth century but was reintroduced in the archaic spelling at the beginning of the twentieth. 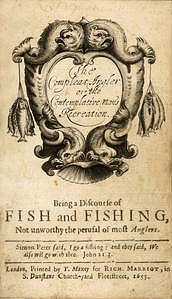 For this we must blame Isaak Walton, the author of The Compleat Angler, or the Contemplative Man’s Recreation; Being a Discourse of Fish and Fishing, not unworthy the perusal of most Anglers. Writing in 1653, he naturally used the older spelling of complete and modern editions retain it. Because Isaak Walton’s book title has remained so well-known, one unexpected result has been that the word in that spelling and in that old sense has been taken as a model in modern times. For example, when Messrs W and A Gilbey published a book on wine in 1953, they couldn’t resist calling it The Compleat Imbiber. You may also find phrases like compleat actor, for someone who has all the skills and qualities of that craft. And the science-fiction writer Ben Bova wrote in his book Mars in 1992: “Jamie realized that his father had become the compleat academic: nothing really touched him anymore; he saw everything in the abstract”. This usage, as I say, is more common in the US than in Britain. So the short answer is that compleat and complete were originally different spellings of the same word, but under the influence of Isaak Walton’s book title the older spelling has taken on a distinct meaning, especially in modern American English. Last modified: 22 July 2000.